It’s just not possible for me to stop coming up with variations on the theme of apples and cheese. I can’t do it. I try, and then I get pulled back in — seduced by the combination of sweet and salty and savory that reminds me of my childhood. There are, of course, endless ways to reinvent the apple-cheese taste sensation. This one, though, is a quick and easy — not to mention fun — lunchbox interpretation. 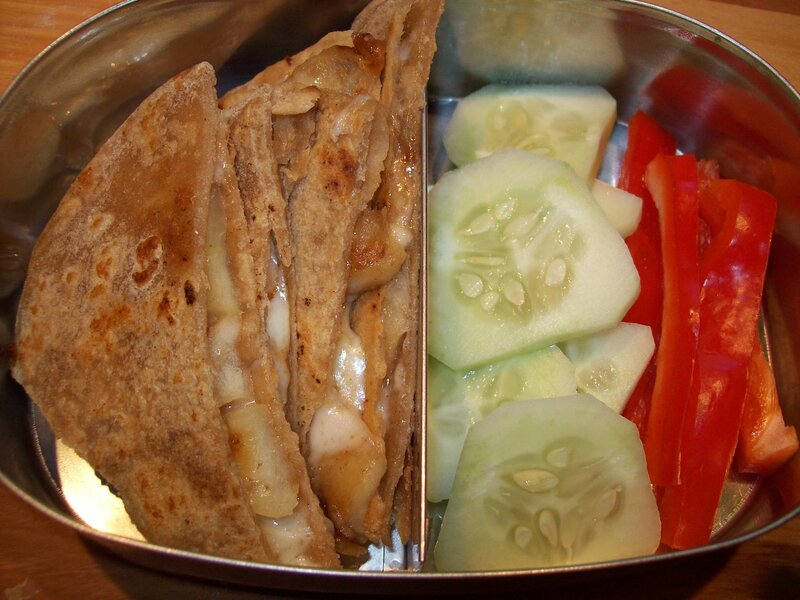 In under 10 minutes, you can easily throw together these sweet apple quesadillas. While the apples are cooking, pack the rest of the lunch, and everything will be ready to go by the time you give the tortillas their last flip. In the end, the result will be a healthy, delicious lunch that tastes a lot like apple pie, but will keep your kid full and ready to learn during a long afternoon at school. In a medium skillet over medium-high heat, melt the butter and add the apples. Cook, stirring occasionally, until the apples start to soften. Add the honey and cinnamon, stir thoroughly, and cook 2-3 minutes more, until apples are fully softened and slightly caramelized. Remove the apples from the pan. Put one of the tortillas into the hot skillet, cover evenly with the cheese slices, and spread the cooked apples on top. Cover with the second tortilla. Cook about 2 minutes on the first side, until golden brown; flip carefully and cook an additional 2 minutes on the second side. Allow to cool before slicing into wedges and packing in the lunchbox.